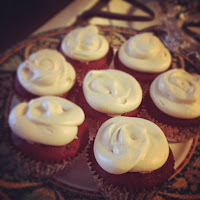 What can make a red velvet topped with fluffy dollops of cream cheese frosting even better? Fill them with a creamy cloud of white chocolate mousse. Aw yeah. I won't belabor this one, I'll just get you to the recipe. 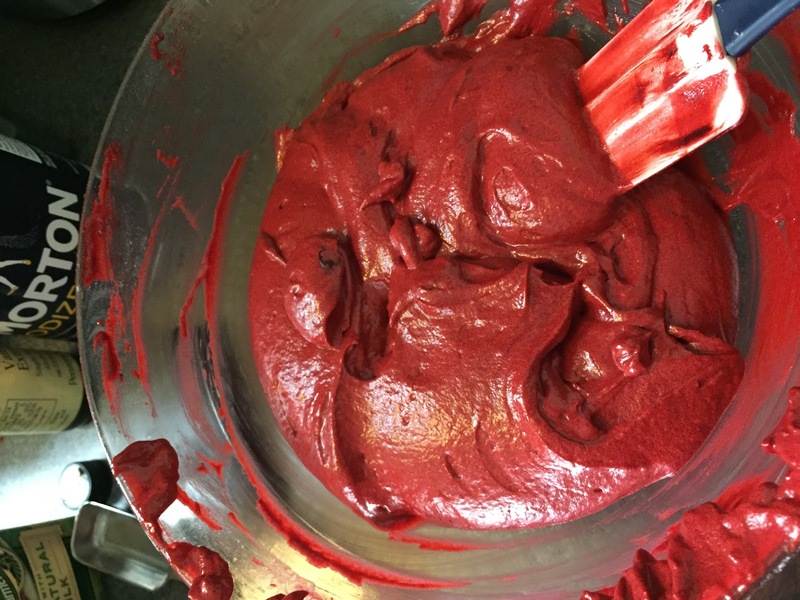 mousse in a chocolate layer cake later in the week. Preheat oven to 350˚. 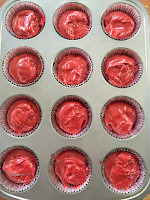 Line standard cupcake pans with cupcake liners. 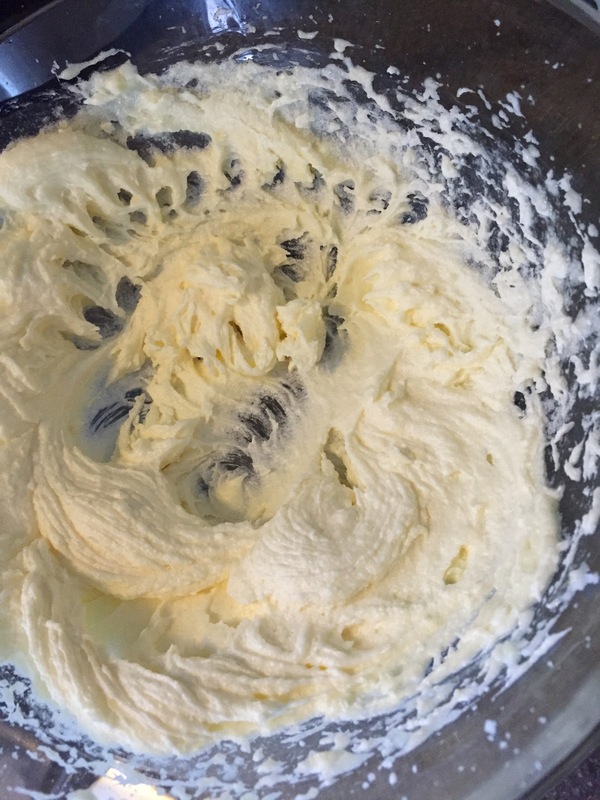 In a bowl, on medium high speed, cream the butter and sugar until fluffy. 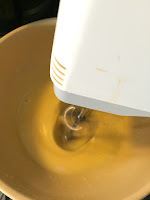 With mixer on high speed, add the egg. 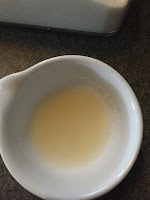 Scrape down the bowl as you go and beat until all is well incorporated and has a nice lemon color. 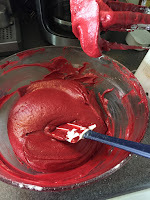 In a separate bowl mix together the cocoa powder, vanilla extract and red food coloring to make a thick paste. Add this to the batter and mix until well combined. 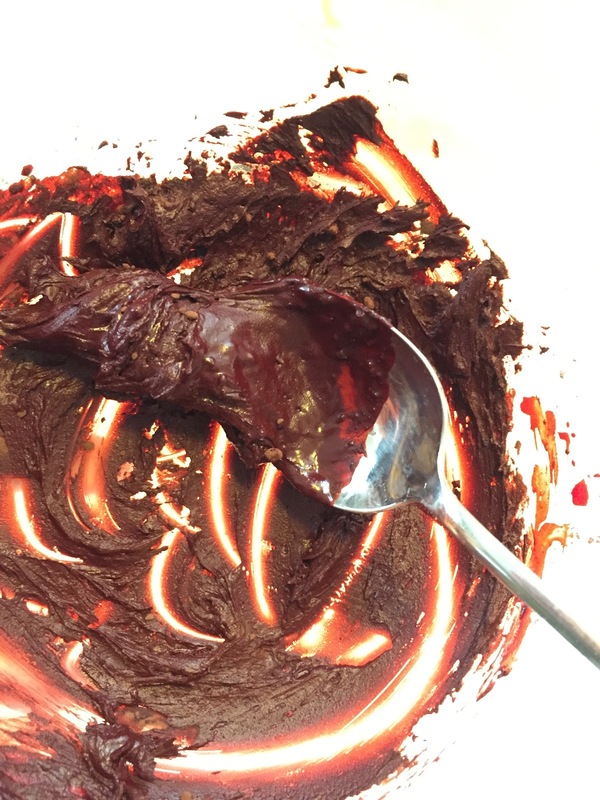 Be sure to scrape the bowl as you go so all the batter gets the coloring. 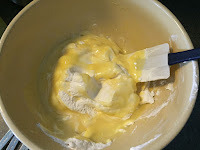 Reduce the mixer to low and add half the buttermilk and half the flour. 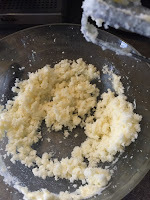 Scrape the bowl's sides and then add the rest of the buttermilk, then the rest of the flour. Then beat on high until smooth. 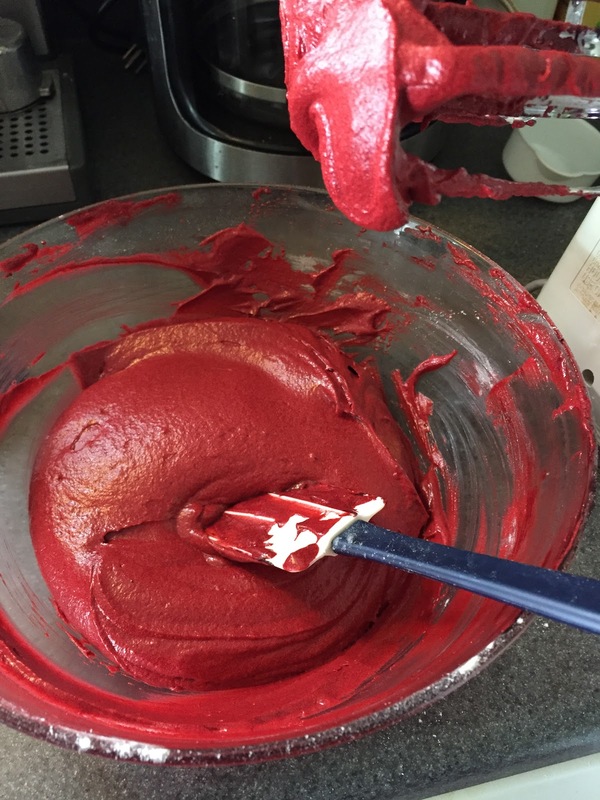 Be careful not to over mix. Next add the salt, the baking soda and the vinegar. Things are going to bubble up and look like a chemistry experiment- that's okay! Turn the mixer on high and for another couple of minutes mix everything until combined well. 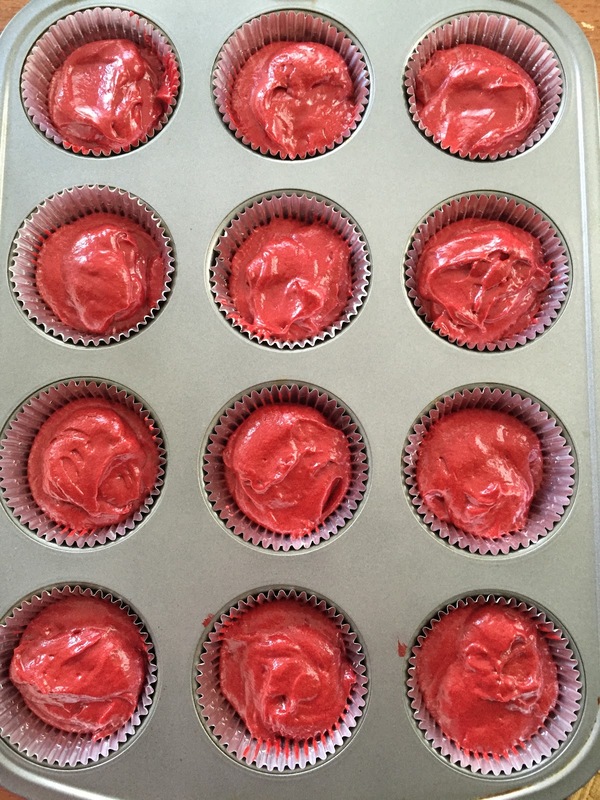 Divide the batter evenly between the cupcake liners, so that each is 2/3rds full. Bake for only about 20 minutes or until a toothpick inserted in the center comes out clean. 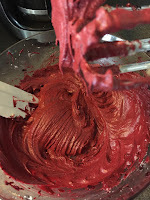 Cool for 10 minutes in the pans and then transfer them to a wire rack to cool completely before filling and frosting. Fair warning, this does need four hours or overnight to set, so time your recipe accordingly. 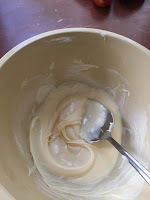 In a small bowl, sprinkle gelatin over the hot water and let stand until softened. Meanwhile in a medium bowl beat the cream with a mixer on high until soft peaks form. 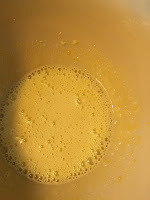 Refrigerate until chilled, about 10 minutes. In a microwave safe bowl, on half power, melt the white chocolate in 30 second increments, until melted and creamy. Let sit to cool down slightly. 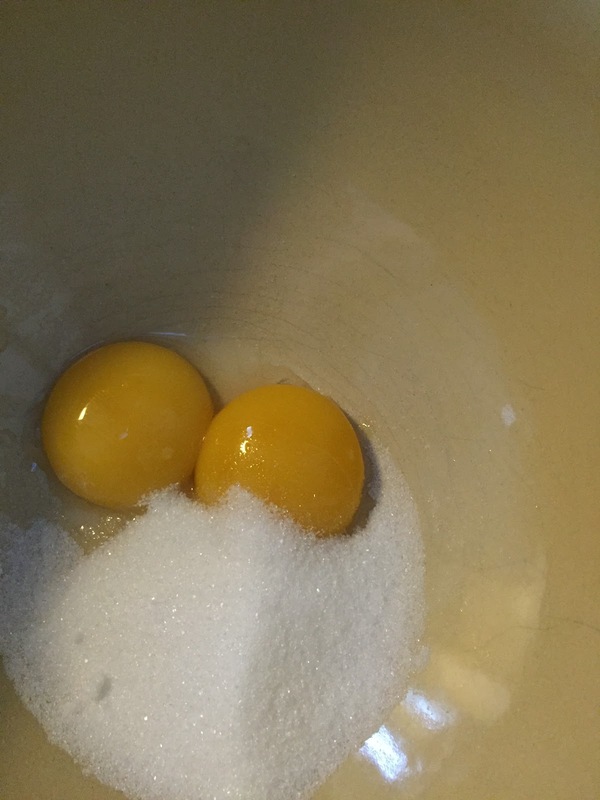 Meanwhile in a medium bowl, beat the eggs with the sugar and salt on high speed until pale and thick. 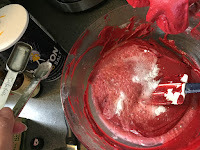 While beating add the gelatin liquid, and scrape the sides of the bowl. 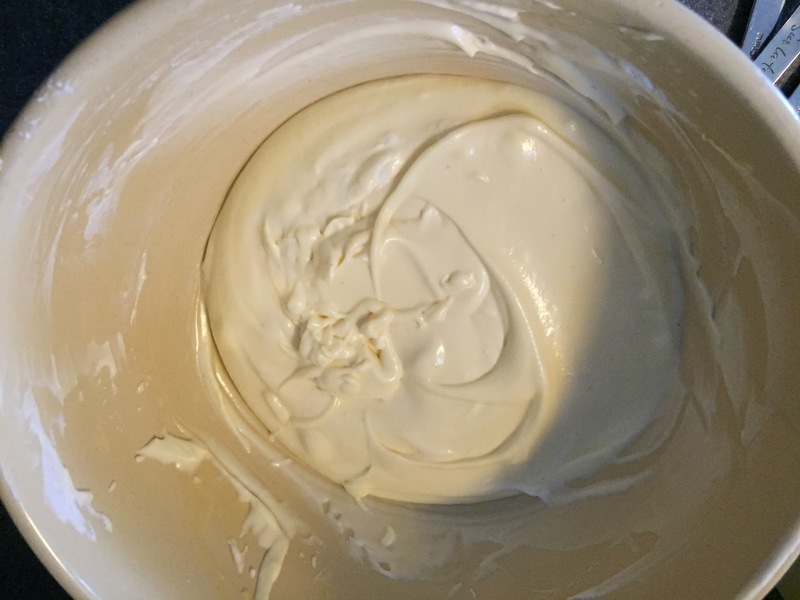 Finally beat in the white chocolate, mixing until well combined. 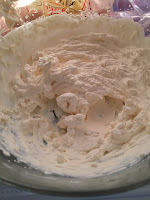 Using a rubber spatula, fold in the whipped cream in two additions until just combined, and cover with plastic wrap. Refrigerate until firm, at least 4 hours or overnight. 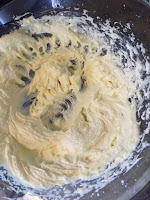 With a whisk attachment on your mixer, cream the butter and the cream cheese on high until well combined and fluffy. Then on low add the powdered sugar until it's all incorporated. 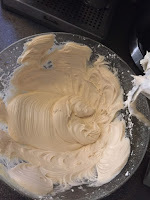 Add the vanilla and increase the speed to mix on high, until frosting is nice and fluffy. 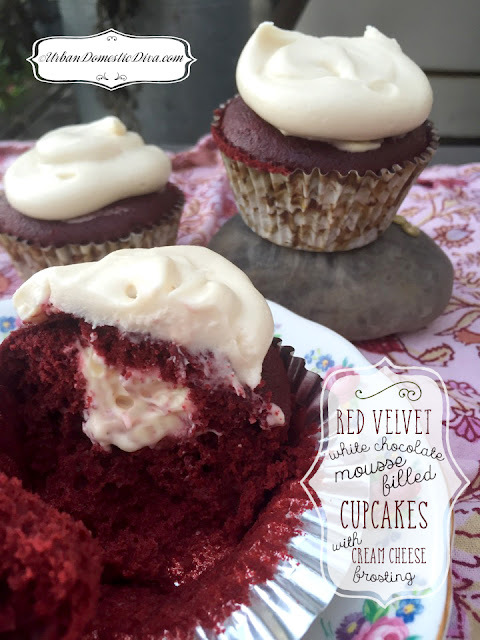 If you make this ahead of time and put it in the fridge, you need to give it some time to warm up at room temperature so that you can spread or pipe the frosting onto the top of the cupcakes. 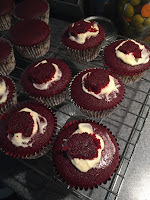 You can use a frosting knife, but I like to use a piping bag to make pretty dollops. Core a hole at the center of each cooled cupcake, half way down. Save the cake piece, and if you want, slice off the bottom of the piece so you just have a flat top you can use as a "cap". Set the caps aside. Pipe or spoon the mousse into each hole. 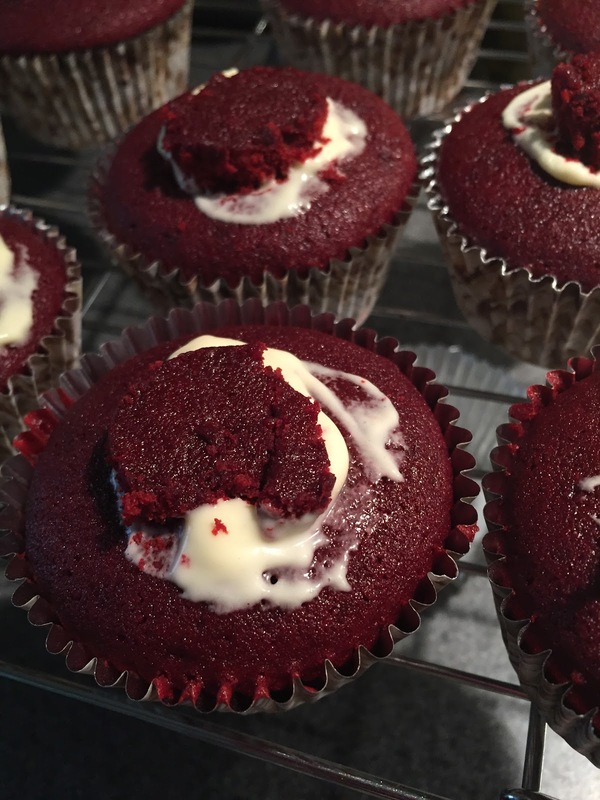 Place a cake "cap" on top of each filled hole. Finally, pipe or spread the cream cheese frosting on top of each. Serve. These are amazing Amazon cupcake liners!! I used them for my son’s birthday party & they were so much better than traditional paper!! Just through them in a bowl after they were done, rinsed them off & put them back in the cupboard! 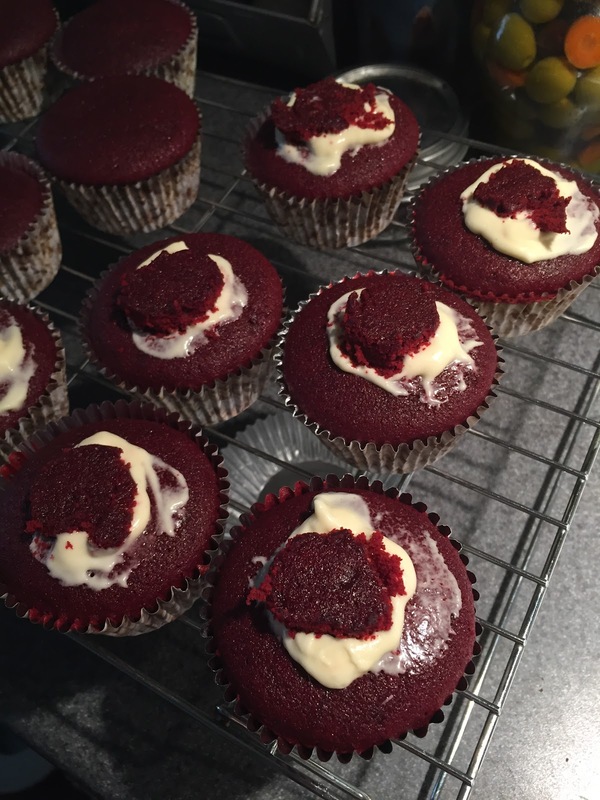 I have used them many times since then and every time the pop out perfectly baked!